Thread: Basting with pool noodles..
Ok, I tryed this and failed miserably! Pin basted ...4 times! !...then went back to my old big table method. Looks easy ,so what did I do wrong? I'd love to do this! What specifically was the issue? top not smooth? bottom had folds????? I used hardwood floor boards (1 x 3" x 8'). The strength and hardness helps me get a tight, taunt, turn on the fabric. I also get a helper to tightly wind the fabric on the boards. It is easier to smooth the fabric as I baste. Another tip: don't unwind too much as you baste, 12-18" is plenty. Keep the rest of the fabric wound on the boards. Did you stabilize the pool noodles by running dowels through the center? If I were to try this, I think stabilizing the noodles would be key. Seems to me that flat wooden boards, similar to what Sharon Schambers uses in her Youtube video, would actually be easier. I did not have too much luck with getting them rolled tight enough and all three layers even. I think it takes two people. I always thought using pool noodles would be challenging, since they're squishy and bendy. I prefer to use them to sword fight with my teen boys. I too had a really hard time with the pool noodles, then I saw this video other day here on the forum, and think it may solve my problem. I was too dense to realize that I needed to pin the fabric to the noodle to get it tight. I haven't tried it yet but I have 3 noodles and also have 2 pieces of 3/4" PVC pipe left over from a chicken project. The PVC fits exactly into the holes in the pool noodles and makes them much sturdier. ie: no bending. The 10ft long piece of PVC at my local Lowes was about 3.00! I think even cheaper than wooden dowels. I spray baste with long cardboard tubes & it would be the same with pool noodles. 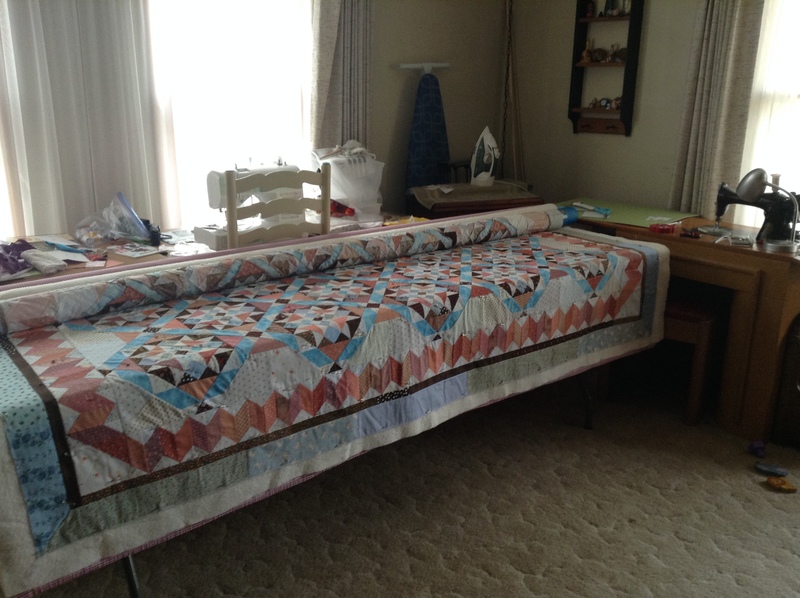 Do you tape the bottom fabric to your table to start? That often helps. Once that's done, roll the batting on a tube, spray an area lightly with spray baste & line up the top of the backing with the batting, unroll the batting to where you stopped spraying, smoothing as you go. Once the batting is on the backing, roll the flimsy on a tube from bottom up & do the same as with the batting. I have very good luck this way. I use June Tailor Spray Baste & it never lets me down! Good luck! I use 1 X 3 boards for the top and backing and a cardboard tube for the batting. I think the weight of the boards helps keep the top and bottom smooth. I really wish that I knew what 'pool noodles' is/are. This conversation is not enlightening me either! You can buy them in Wal-Mart and put a dowl rod through the center. You then roll the backing, batting and top onto each one. It is a method of basting. It worked for me, but I've only done it once, so I don't have much experience yet. Here's a good quick video showing it. Mr. google is your friend. I use the noodles with spray basting. Works fine for me. I pin basted once and threw all the pins away after that one time. I detested it.